To American sports betting fans, the second week of March is known as one of the most exciting times of year. It means it is time for NCAA March Madness. Bettors from around the country engage in “bracketology” as they attempt to draw up the perfect bracket for the NCAA Basketball playoffs. Bettors will look at all sets of stats in an attempt to make the best predictions. But there are always some results that even the greatest of sports fans will never be able to predict. On this page, we have a look at the good, old NCAA bracketology. Bracketology is basically the action of attempting to predict which teams will participate in the NCAA Division I Basketball Tournament, which teams will go up against each other, and the winners of subsequent match ups. Ultimately, it is one of the hardest predictions to make within sports. Many mathematicians suggest that there is one in a quintillion (the equivalent of two billions) chance that a person could successfully predict every match up in the tournament. There are loads of sports books that allow you to bet on the bracket. We strongly recommend that avid sports bettors use one of the sites we have listed above. March Madness is a month-long tournament that sees the best teams in American college basketball go up against each other. Bettors need to pay attention to every important game leading up to the tournament (including the First Four) if they are to predict successful brackets. Most of the best sports books give players a number of different betting options, including betting on specific brackets. 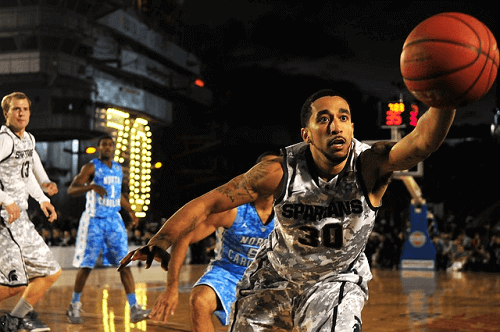 For the best in NCAA Basketball betting, we recommend looking at the sites listed above. The first seed is almost always makes it to the Final Four. With the exception of a handful of competitions, the first seed has made it to this round every single year. According to recent history, most winners are usually seeded between first and third. In the last 15 years, only one team from outside of the top three have been lucky enough to win the Championship. Don’t bet on Cinderella stories. While low-seeded teams have progressed to the Final Four before, statisticians have shown that such scenarios are highly unlike. In fact, teams with double-digit seeds are thought to have a 2% chance of making it to the later stages. Remember that March Madness is a marathon and not a sprint. This means that you should be pacing your bets as the competition goes along. We recommend that you make a bet on the participants of the Championship game first, and then try to focus on the matches en route to the final. Since being launched in 1939, the NCAA Division I Basketball Tournament (also known as March Madness) has gone through changes. The tournament started with eight teams. It has since exploded into a yearly tournament featuring 68 of the best college basketball teams from across the country. Probably, the most exciting aspect of this tournament is the single-elimination styling, which means you’ve got one chance at the championship and should you lose, you’ll only have another chance next year. Teams are divided and seeded according to their region making for some very interesting betting odds. With over 66 games, and so many wonderful betting options available to sports betting fans, NCAA March Madness has grown to become one of the most exciting annual college sports events.